Living in a sunny barsati in south Delhi, Saurav Jha and Devapriya Roy are your average DINK couple, about to acquire a few EMIs and come of age in the modern consumerist world. Only, they don’t. They junk the swivel chairs, gain a couple of backpacks and set out on a transformational journey across India. On a very, very tight budget: 500 rupees a day for bed and board. 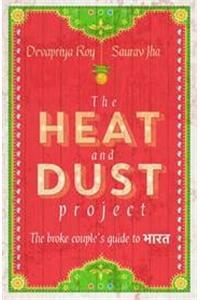 And ‘The Heat and Dust Project’ begins.Joining the ranks of firang gap-year kids and Israeli boys and girls fresh out of compulsory army service, they travel across a whacky, whimsical land, where five thousand years of Indian history seem to jostle side by side. It is, by turns, holy and hectic, thuggish and comic, amoral and endearing. In buses that hurtle through the darkness of the night and the heat of the day, across thousands of miles, in ever new places, the richness of this crowded palette spills over into their lives. From rooms-by-the-hour to strange dinner invitations and spectacular forts and tantrums, this is a tale of the hysterical searching of youth, of eccentric choices and the supreme test of marriage. Saurav Jha was trained in economics at Presidency College, Calcutta, and Jawaharlal Nehru University, New Delhi. He is a commentator on energy and security issues and contributes regularly to World Politics Review, The Diplomat, Le Monde Diplomatique, and The Telegraph besides being Consulting Editor of Geopolitics magazine. His first book, The Upside Down Book of Nuclear Power was published in March 2010. Devapriya Roy is the author of two novels, The Vague Woman’s Handbook (2011) and The Weight Loss Club (2013). She has degrees in literature and performance studies from Presidency College, Calcutta, and Jawaharlal Nehru University, New Delhi.